Jockey James Winks and Danny O'Brien have combined for Group 1 glory and they teamed again to snap a run of outs for the trainer with At The Heads in yesterday's listed Chester Manifold Stakes at Flemington. As No 1 rider, Winks won Group 1 races on Star Witness, Douro Valley and Absolut Glam for O'Brien, but the partnership split aroudn 18 months ago. "It just didn't work out," Winks said. He said there was no longer a formal agreement for rides with O'Brien, but opportunities were still available. "He's got 120 horses, so there are a lot of good rides. I'm a hard worker and I'm happy to just float in and float out," he said. "I'm rebuilding the bridge. I'm hoping it doesn't crack this time." The race wasn't all good news for Winks as stewards later suspended him for eight meetings for careless riding. Winks, who will start his suspension today, pleaded guilty to causing Shout Out Loud to shift in near the 100m,causing Mr Make Believe to be checked. 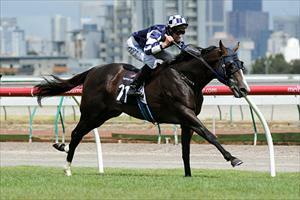 O'Brien's previous Melbourne winner was Meethaq at Caulfield on October 12. In the meantime, O'Brien had logged a frustrating 11 second placings. At The Heads ($10) had been a beaten favourite at his previous two starts, but was given a textbook ride by Winks to score in the $150,000 Chester Manifold (1400m). Previously unbeaten three-year-old Pied A Terre ($3 to $2.35 fav) tried hard, but was no match for the winner, who scored by 1 3/4 lengths. On the Gold Coast for the Magic Millions yearling sales, O'Brien told Winks that the gelding could win, provided he got the right run. "He switched off and hit the line well. Danny said he needs the right run in the race and he can win," Winks said. O'Brien bought four yearlings over the first three days of the Magic Millions sales, including a $240,000 Encosta De Lago colt.